Why not check out our powerful NestFab automatic nesting product. 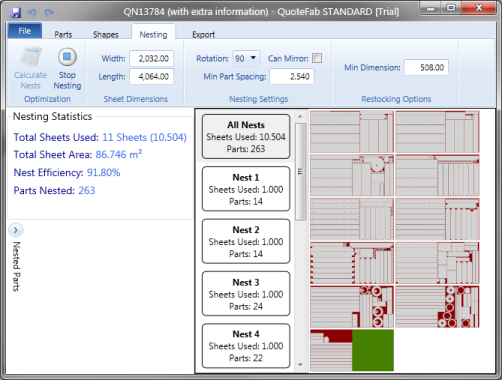 The world's most efficient nesting software that just gets the job done. We are delighted to announce the release of our new innovative online quoting service CutQuote which enables profile cutters to produce consistent, accurate and profitable quotes with the fastest turnaround time possible. CutQuote provides unique features not available in any other online quoting system and gives you full control over costing parameters and profit targets to ensure consistency and professionalism across all sales staff within your organization. We are committed to providing the best nesting solutions at the most competitive prices. Get in contact with us by email at sales@efficientsoftware.co.uk or give us a call on +44 115 9792555. We will be happy to discuss all aspects of our nesting software and answer any of your questions.